August was the biggest month ever for U.S. gasoline consumption. Americans used a staggering 9.7 million barrels per day. That’s more than a gallon per day for every U.S. man, woman and child. The new peak comes as a surprise to many. In 2012, energy expert Daniel Yergin said, “The U.S. has already reached what we can call peak demand.” Many others agreed. The U.S. Department of Energy forecast in 2012 that U.S. gasoline consumption would steadily decline for the foreseeable future. This seemed to make sense at the time. U.S. gasoline consumption had declined for five years in a row and, in 2012, was a million barrels per day below its July 2007 peak. Also in August 2012, President Obama had just announced aggressive new fuel economy standards that would push average vehicle fuel economy to 54 miles per gallon. Fast forward to 2016, and U.S. gasoline consumption has increased steadily four years in a row. 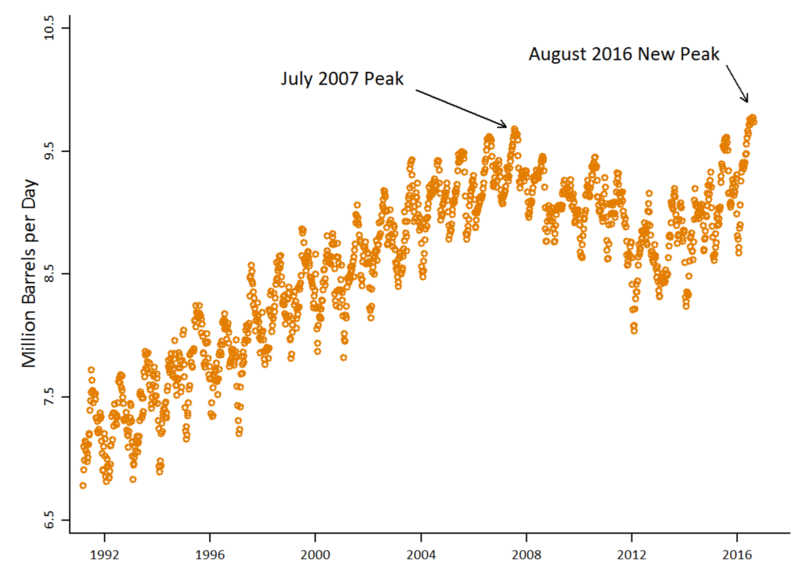 We now have a new peak. This dramatic reversal has important consequences for petroleum markets, the environment and the U.S. economy. How did we get here? There were a number of factors, including the the Great Recession and a spike in gasoline prices at the end of the last decade, which are unlikely to be repeated any time soon. But it should come as no surprise. With incomes increasing again and low gasoline prices, Americans are back to buying big cars and driving more miles than ever before. The slowdown in U.S. gasoline consumption between 2007 and 2012 occurred during the worst global recession since World War II. The National Bureau of Economic Research dates the Great Recession as beginning December 2007, exactly at the beginning of the slowdown in gasoline consumption. 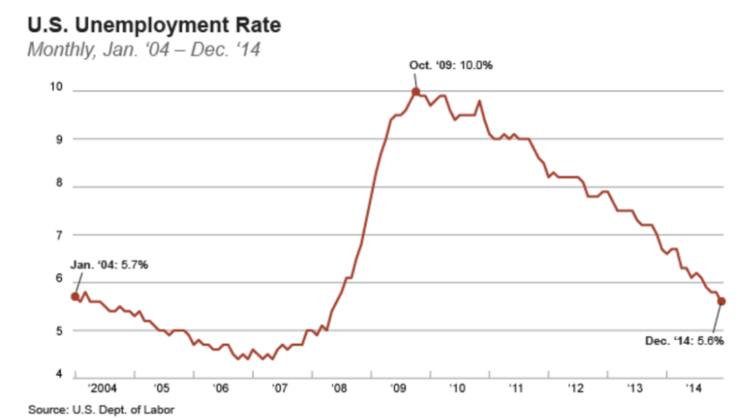 The economy remained anemic, with unemployment above 7 percent through 2013, just about when gasoline consumption started to increase again. 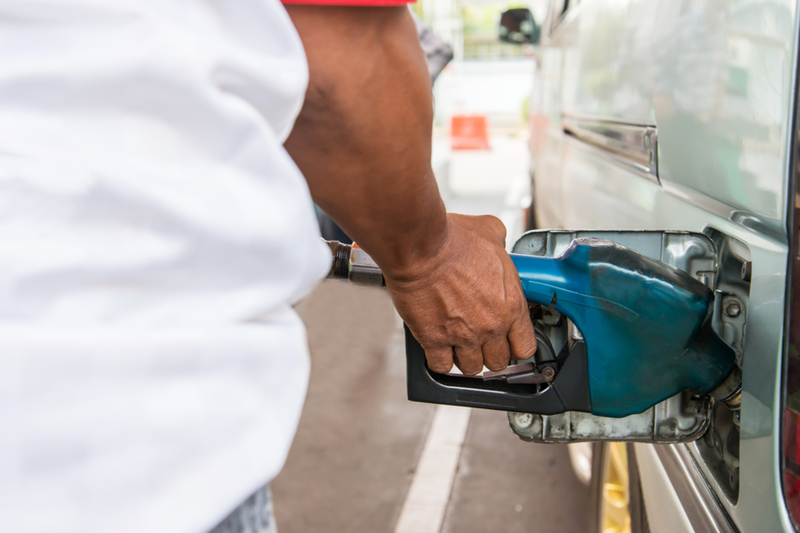 Economists have shown in dozens of studies that there is a robust positive relationship between income and gasoline consumption – when people have more to spend, gasoline usage goes up. During the Great Recession, Americans traded in their vehicles for more fuel-efficient models, and drove fewer miles. But now, as incomes are increasing again, Americans are buying bigger cars and trucks with bigger engines, and driving more total miles. The other important explanation is gasoline prices. During the first half of 2008, gasoline prices increased sharply. It is hard to remember now, but U.S. gasoline prices peaked during the summer of 2008 above $4 gallon, driven by crude oil prices that had topped out above $140/barrel. 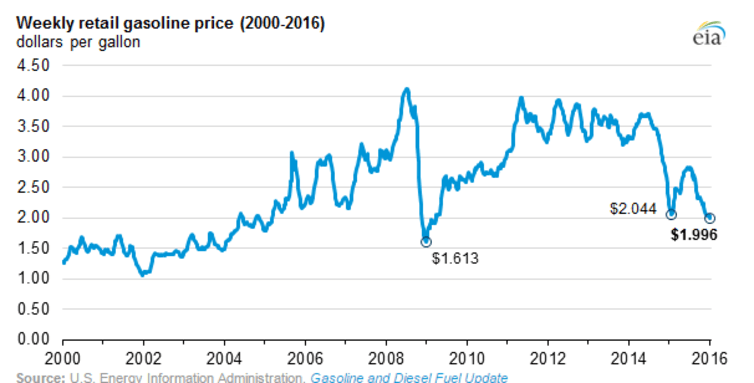 These $4.00+ prices were short-lived, but gasoline prices nonetheless remained steep during most of 2010 to 2014, before falling sharply during 2014. 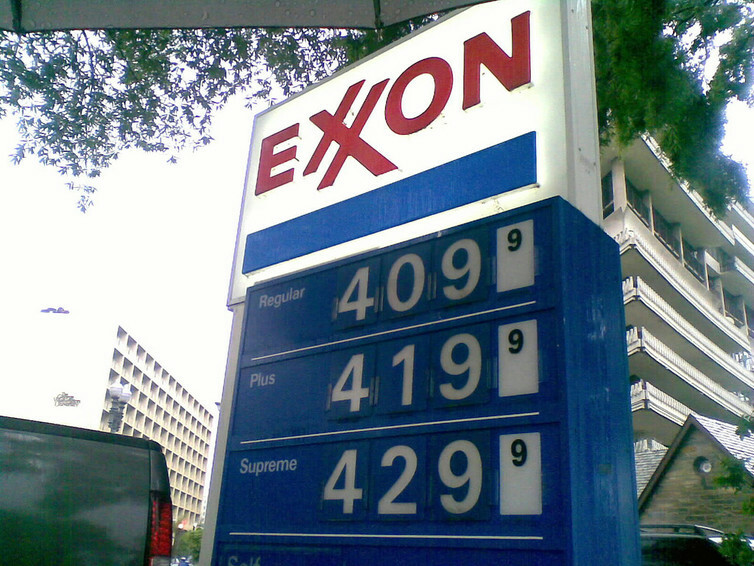 Indeed, it was these high prices that contributed to the decrease in U.S. gasoline consumption between 2007 and 2012. Demand curves, after all, do slope down. Economists have shown that Americans are getting less sensitive to gasoline prices, but there is still a strong negative relationship between prices and gasoline consumption. Moreover, since gasoline prices plummeted in the last few months of 2014, Americans have been buying gasoline like crazy. Last year was the biggest year ever for U.S. vehicle sales, with trucks and SUVs leading the charge. This summer Americans took to the roads in record numbers. The U.S. average retail price for gasoline was $2.24 per gallon on August 29, 2016, the lowest Labor Day price in 12 years. No wonder Americans are driving more. Can Fuel Economy Standards Turn the Tide? It’s hard to make predictions. Still, in retrospect, it seems clear that the years of the Great Recession were highly unusual. For decades U.S. gasoline consumption has gone up and up – driven by rising incomes – and it appears that we are now very much back on that path. This all illustrates the deep challenge of reducing fossil fuel use in transportation. U.S. electricity generation, in contrast, has become considerably greener over this same period, with enormous declines in U.S. coal consumption. Reducing gasoline consumption is harder, however. The available substitutes, such as electric vehicles and biofuels, are expensive and not necessarily less carbon-intensive. For example, electric vehicles can actually increase overall carbon emissions in states with mostly coal-fired electricity. Can new fuel economy standards turn the tide? Perhaps, but the new “footprint”-based rules are yielding smaller fuel economy gains than was expected. With the new rules, the fuel economy target for each vehicle depends on its overall size (i.e., its “footprint”); so as Americans have purchased more trucks, SUVs and other large vehicles, this relaxes the overall stringency of the standard. So, yes, fuel economy has improved, but much less than it would have without this mechanism. Also, automakers are pushing back hard, arguing that low gasoline prices make the standards too hard to meet. Some lawmakers have raised similar concerns. The EPA’s comment window for the standards’ midterm review ends Sept. 26, so we will soon have a better idea what the standards will look like moving forward. Regardless of what happens, fuel economy standards have a fatal flaw that fundamentally limits their effectiveness. They can increase fuel economy, but they don’t increase the cost per mile of driving. 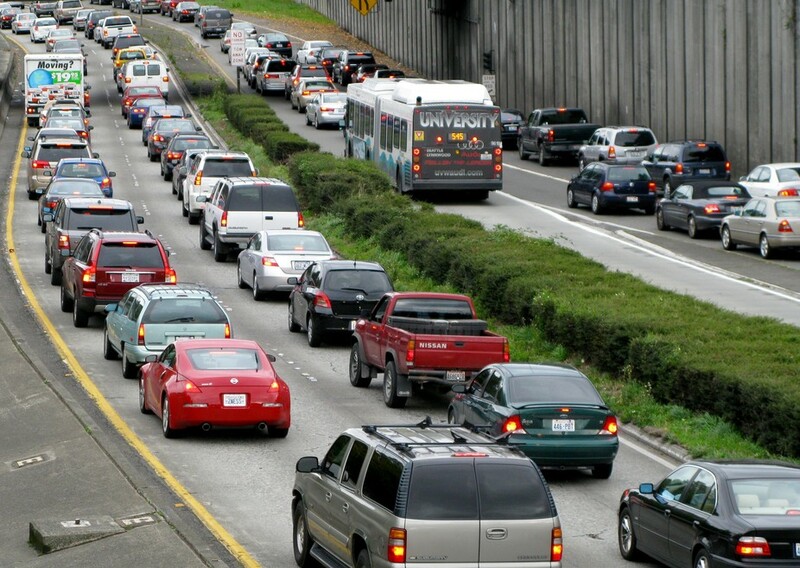 Americans will drive 3.2 trillion miles in 2016, more miles than ever before. Why wouldn’t we? Gas is cheap. I think it is the most serious issue now a days with us citizens. India gasoline consumption reached a new record high in August due to growing demand from millions more motorcycles. China gasoline consumption in July increased 5.8% from a year ago, and in Beijing a seventh concrete-ring freeway is being built for a sprawling Beijing that will reach a population of 130 million. Population growth in excess of resources is driving immigration from Central America to the United States. Population growth is the major factor in housing becoming unaffordable. The world population has almost tripled from 1950 to the present, growing from 2.5 billion people in 1950 to 7.5 billion people very soon. It’s funny how people don’t understand the awesome dynamic of unrelenting population growth. Refreshing to see a post acknowledging the Elephant-in-the-Living-Room, population growth. Usual tripe is always to guild something as a “challenge” and completely fail to cite the underlying cause. Where can we find the broader context for comparison? Are other first-world economies also showing the same kind of idiocy? Is it really inevitable that microeconomic trends and individual driver decisions will kill our grandchildren, with nothing but weak fuel economy legislation to stand in the way? Has the possibility of other ways of thinking about large problems really fallen from our grasp already?